• In 1941, Reverend William Huffman of Cape Girardeau, Missouri was called by the local sheriff to come and assist in delivering some sort of last rights at a plane crash. When Huffman arrived at the scene, he realized that it was not a plane but rather a classic silver flying saucer. There were multiple dead bodies on the scene, which appeared to be extraterrestrial. 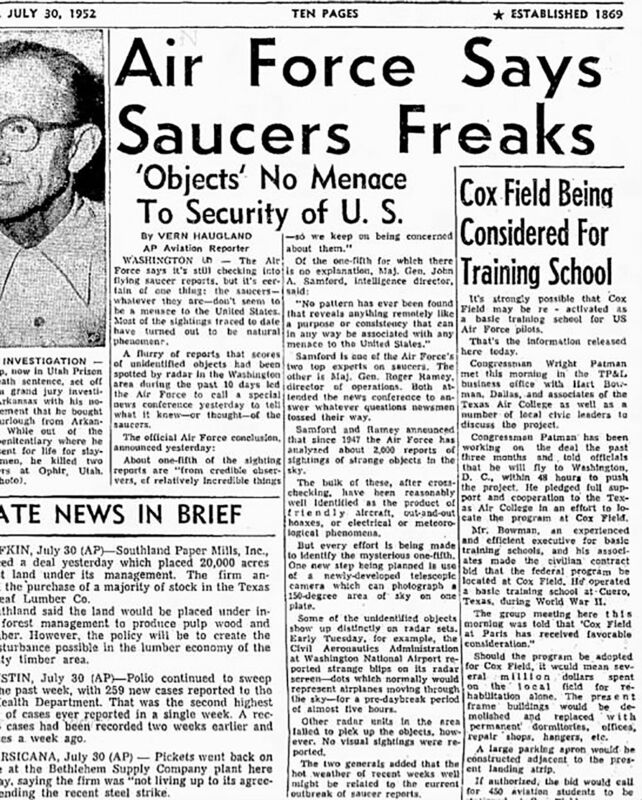 • UFO researcher Leonard Stringfield, who heavily researched this case, says that near the scene of the saucer crash were laid ‘three bodies, not human’. It was hard to tell if these ET’s were wearing clothes, but they were covered head to foot in what looked like wrinkled aluminum foil. They were small framed, about 4 feet tall, but had larger heads and longer arms. They had no hair. Their faces had ‘large, oval-shaped eyes, no noses, no ears, just holes and no lips, just small slits for mouths’. • Huffman was told by one of the military officers at the scene not to tell anyone what he had witnessed for security reasons. Nevertheless, Huffman told his wife, Floy, and their two sons what he had seen when he returned home from the crash site but never spoke of it again. • As time goes on, more truths will continue to be revealed. This (UFO) topic and the disclosure of it leaves no aspect of humanity untouched. It will and is changing everything with regards to how we view the planet, and how we view ourselves. Roswell, New Mexico is known for the famous alleged ‘crash’ that happened there in 1947. But if you’re not a UFO researcher, you probably wouldn’t know that alleged crashes of unidentified objects with alien bodies found inside of them have occurred dozens of times, not just at Roswell. Why Roswell became the focus of attention for this type of phenomenon, who knows, but perhaps it was the big media hype surrounding the crashed craft at that site with bodies recovered. The idea that alien bodies were recovered as well as a crashed craft not only came from media outlets at that time, but from what are considered to be very credible sources within the military like Colonel Philip Corso, author of the book The Day After Roswell, and Dr. Edgar Mitchell, the sixth man to walk on the moon during Apollo 14. Not only do we have credible witness testimonies for this type of thing, but we have an abundance of declassified documentation and current modern day mainstream disclosure of ‘UFO technology’ as well. For example, Steve Justice, the recently retired Director of Advanced Systems at Lockheed Skunkworks, who signed on board with the modern day mainstream UFO disclosure initiative To The Stars Academy, has stated publicly that it would be an understatement to call the technologies he’s been around, worked with, and seen, “revolutionary.” It states that right on their website. What he is saying here is that we have these technologies. The quote “harvest them from the Science Division” gives that away. As far as documentation, the amount of electrooptical data and files indicating various military encounters with UFOs is outstanding. We also have evidence that governments are and were desperate to reverse engineer this technology, and given the above statements, they already have. 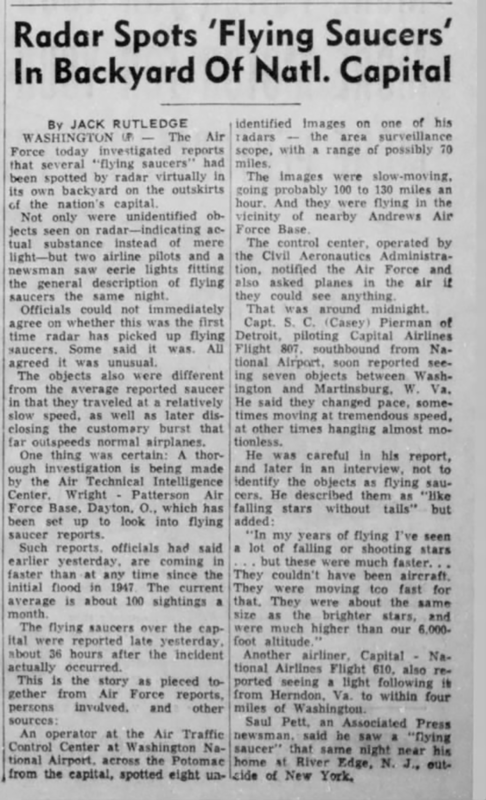 • In July of 1952, as UFO fever spread across Cold War America, the “grandfather of all ‘saucer’ sightings” took place in the skies above the nation’s capital. 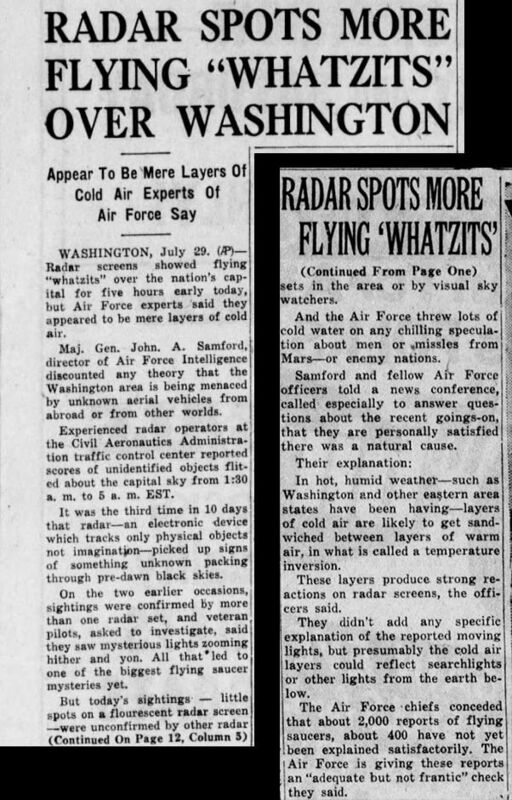 Over several weeks, up to a dozen unexplained objects repeatedly streaked across the skies over Washington, D.C. – spotted by radar operators, professional pilots and other highly credible witnesses. The ‘saucers’ outran Air Force fighter jets. 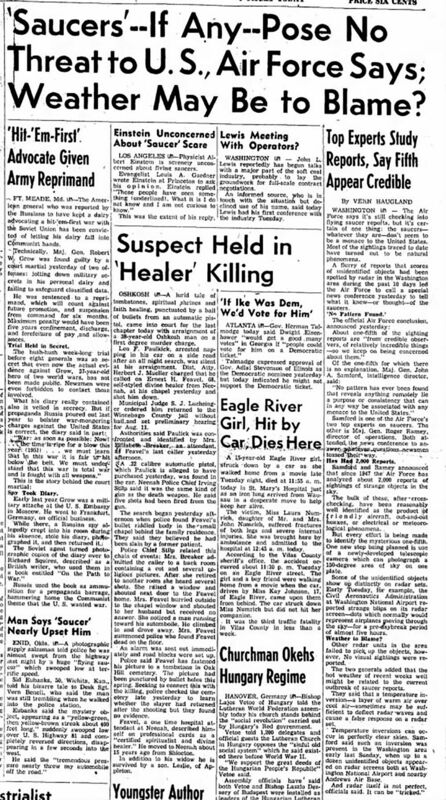 • When President Harry Truman called for answers, the Air Force’s Project Blue Book hastily convened a press conference, blaming the whole thing on the weather. • Nationwide, newspaper headlines blared the fantastic news. Local publications ran stories, many drawn from national wire services, often edited with different details to fit their space. Some added sidebars with local ‘saucer’ news or tidbits like what Albert Einstein thought when asked about UFOs. One reporter got the bright idea to ask the Soviets if they were somehow behind it all. • Below are some original clippings from around the nation during that extraordinary historical moment. Click on the newspaper title to link to the original article. If 1952 marked the year that UFO fever spread across Cold War America, events in late July of that year spiked that mania to critical levels. That’s when the grandfather of all “saucer” sightings took place in the skies above the nation’s capital, causing a coast-to-coast collective jaw drop. Over several weeks, up to a dozen unexplained objects repeatedly streaked across the skies over Washington, D.C.—spotted not just by crackpots, but by radar operators, professional pilots and other highly credible witnesses. The Air Force scrambled fighter jets, but the ‘saucers’ outran them. 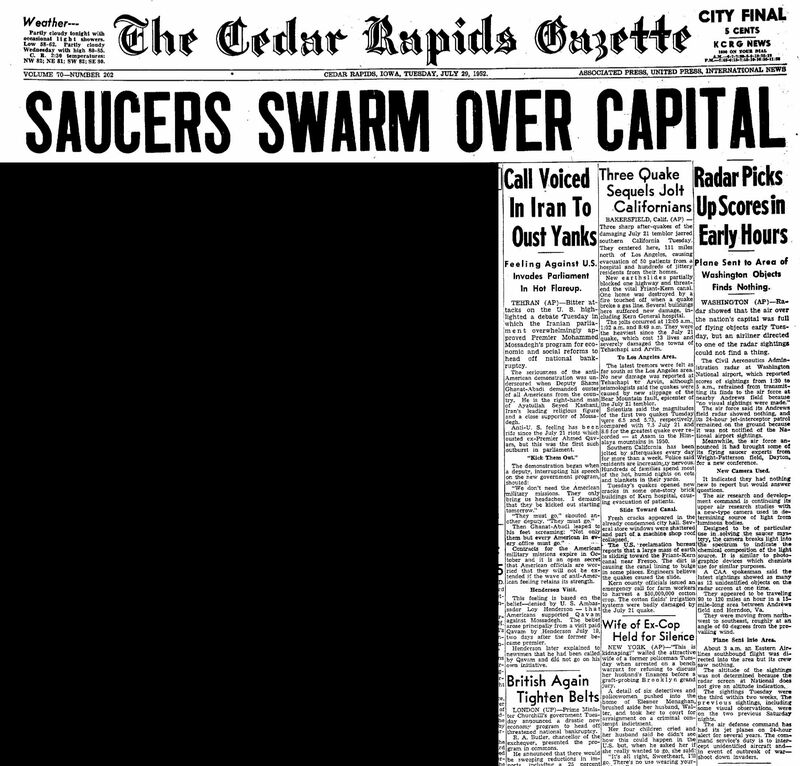 Around the U.S., sci-fi-like headlines blared, rumors flew and sightings soared. When President Harry Truman quietly called for answers, a representative from the Air Force’s secret UFO-investigation team, Project Blue Book, was summoned to D.C. But before anyone could fully probe the incidents, the Air Force hastily convened a press conference to quell the panic, blaming the whole thing on the weather. The incident didn’t just get covered in big-city papers. In every corner of the country, local publications ran stories, many drawn from national wire services, often edited with different details to fit their space. 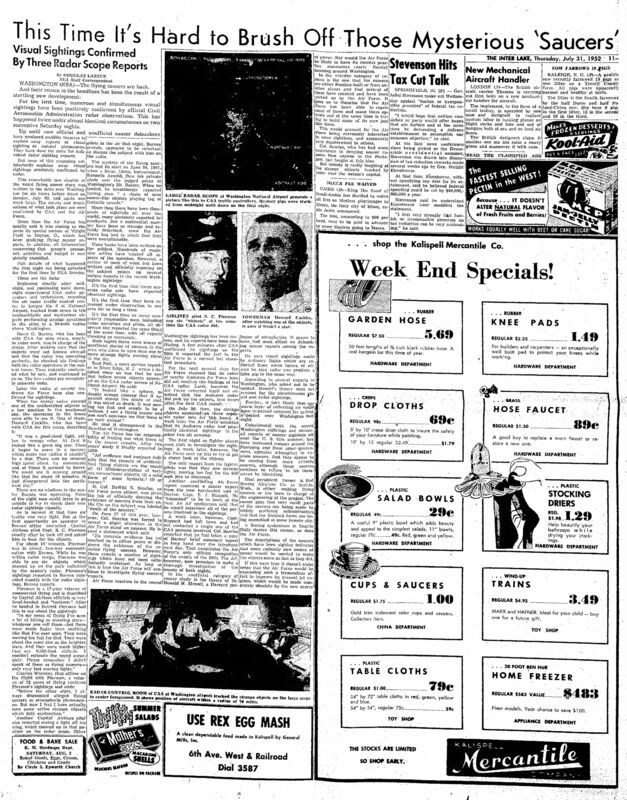 Some added sidebars with local ‘saucer’ news or tidbits like what Albert Einstein thought when asked about UFOs. One reporter got the bright idea to ask the Soviets if they were somehow behind it all.